I would guess that most of us have experienced 'road rage' at some time or other, either by getting angry with a fellow road user or by being on the receiving end of an outburst. At one end of the scale this phenomenon takes the form of a mild annoyance at the inconsiderate driving habits of another, while at the top end motorists have been known to leave their vehicles and have even come to blows. What is happening here? It could be suggested that the target of the road rage has violated the perpetrators sense of what should be done, of the correct way of staying in the right lane, or of following the Highway Code. 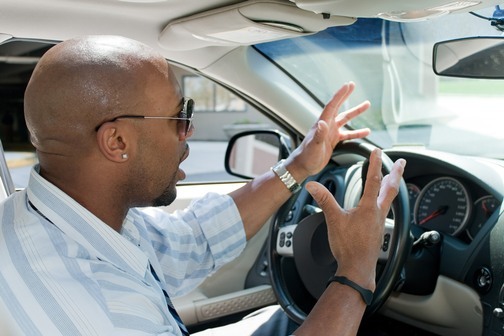 The person feeling road rage is so angry that this has been done that they feel they are justified in venting their feelings towards the other motorist. I would argue that while the annoyance or anger felt by the disgruntled and wronged party is perhaps a perfectly understandable response, the rage they express is not the most healthy outlet for these feelings. In the counselling room, clients who present with anger issues are often angry about lots of different things, yet with only a few core causes. Sometimes there is only one real reason for their rage, and once this is identified and dealt with, rage can subside and calm is more the norm. I sometimes think of this as being similar to an angry bear who has a thorn in its paw; once the thorn is removed, the bear can return to living out its life in a peaceful and stress-free way. The trick seems to be for the bear (or person, in the case of road rage) to realise that they have this thorn that needs attention. Talking things through in confidence with someone you can trust can be enormously helpful in identifying underlying tension which can bubble up quite readily when we are under stress. The rewards of tackling unresolved feelings can be considerable, and can often lead to happier households and more pleasant journeys for all.